I don't remember if I ever wrote about the Mother's Day event that I took part in. A while back CODEPINK Women for Peace had a protest against the war planned for Mothers Day that involved knitting. 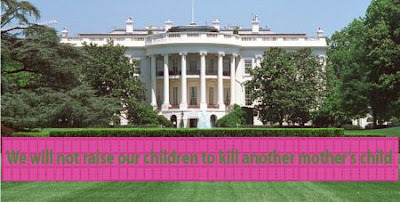 They wanted to get pink and green knitted swatches to create a cozy to cover the fence in front of the White House that said "We will not raise our children to kill another mother's child." I saw this call out for swatches, so I knit a swatch for me as well as one in honor of my mum. The second link for CODEPINK has a bunch of videos and pictures of the actual cozy getting sewn toghter as well as being put up in front of the White House on Mother's Day. 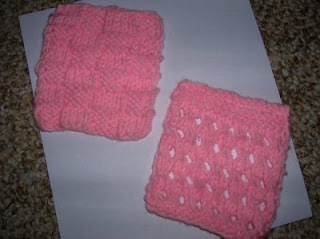 I used some acrylic yarn that I found in the back of the closet for both 4"x4" swatches. 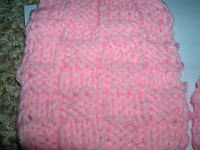 One was a basic basket weave type of stitch pattern. The other was a simple eyelet pattern. Both patterns were found in 200 Knitted Blocks (Ravelry link). So I am very against the war (sorry to bring politics into this blog... I try to keep it from swaying that way), but I don't agree with EVERYTHING that this group does. However, I thought this project was a meaningful on an important day. So I was glad to contribute my 2 little swatches to a day with a loud voice and big meaning. 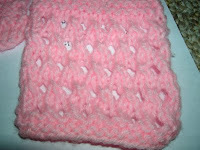 I knit some squares too. I was worried about how organized they were- were they going to get enough squares? have enough people to seam them? etc. But I have to say they did a great job and it looked great in the end. They posted pictures on their website of the finished cozy, I don't know if you saw them. I was going to type that I'd seen a post about this on Knitting Like It's my Job too:) You guys rock for taking part...and the pics the organization posted on flickr are awesome.